I do love a pretty wedge of Classic Bakewell Tart (with a nice cup of tea, of course! ), but sometimes I want to serve more people. I could make two proper 9-inch tarts, but that does seem like a lot of trouble, doesn't it? So I decided to try it as a traybake. A lot of people don't have tart tins anyway. And if you don't have a quarter-sheet pan, you could use a 13x9x2-inch pan; but I recommend you get one or more quarter-sheet pans as they are good for sooooo many things. What you don't need for this recipe, besides tart tins, is a mixer or food processor or anything that has to be plugged in. You don't even need a rolling pin. Just make the easy pastry in a bowl, throw it into the pan and press it into the bottom of the pan and partially bake it. Then stir up the filling right in the pan in which you melt the butter. Spread on the jam. Pour on the filling. Throw on the sliced almonds. Pop it into the oven for 25 to 30 minutes, and Bob's your uncle, as they say in the home of Bakewell Tarts! I was actually a bit short (38 grams) on the almond flour and was too cheap to spring for another bag of it, so I just used unbleached all-purpose flour to make up the difference. Perfectly delicious. No need to panic. Bakewell Tart is very rich, so bear that in mind when cutting portions. For an afternoon tea, where everything must be tiny and cute, you could cut it into 48 squares. For the neatest slices, be sure to wait until it is completely cool to cut it. Note: if you're gluten-free, do my Gluten-Free Pie Crust. 1 Spray a 13x9x1-inch (33x23x3 cm) quarter-sheet pan with cooking spray. In medium mixing bowl, whisk together flour, powdered sugar and salt. With your fingertips, rub in the cold shredded butter to a crumb texture with some bigger hunks of butter remaining. Sprinkle on egg yolk-water mixture and mix in, adding more water, if needed, just a teaspoon at a time. Put dough in prepared quarter-sheet pan and press it in an even layer on the bottom of the pan, just ever so slightly onto the side so that when it shrinks during baking the bottom will be completely covered. Pop it in the freezer for 15 minutes while you preheat the oven to 375F/190C/Gas5. Note: You can also line the bottom with parchment paper, leaving a little overhang on the ends so you can lift the cooled tart from the pan all in one piece. But this time I just cut it in the pan. 2 Bake for about 20 minutes until slightly browned to a pale golden. Let stand to cool a bit while proceeding with the recipe. 3 While pastry is cooling, make the filling. In 2-quart saucepan over medium heat, melt the butter. Take off heat, and stir in the sugar; then the ground almonds, eggs and reserved white, almond extract and salt until well combined. 4 Spread the jam over the bottom of the prebaked pastry shell. Pour in the frangipane. Top with sliced almonds. Bake for about 25 to 30 minutes. Cool to room temperature, about 1 hour. Serve at room temperature or chilled. Dust with sifted powdered sugar just before serving. Oh it looks soooooooo delicious! I must make this. Thanks for visiting me this morning. Thank you, Marilyn. You'll find it's really good with a cup of tea! The coveted, if tentative, 5 cleavers is an honor I don't take lightly, Sully. And, though this is a very buttery thing already, I'm never opposed to "smearing [more] gobs of butter" on anything! Thank you, Christine! And they would look so good on one of your gorgeous serving pieces! This beautiful dessert looks like something that I must try. 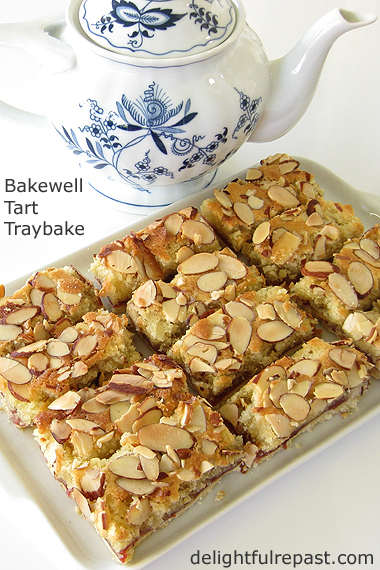 These frangipane slices/tray bakes look utterly delicious! Sandra, thank you. I hope you will! Thank you, Angie. It's the sort of thing you bite into and pause, close your eyes and say Mmmm! Martha, thanks! And I do hope you'll try it soon and let me know how it turned out for you. Dawn, I think I've streamlined the tart into something even a busy mum has time to make! Let me know if you make it! I didn't know that this is what a Bakewell tart is! Thanks! You know, I had never stopped to wonder exactly what goes into a Bakewell Tart! Thank you so much for the recipe and the reminder that this is a somewhat rich treat, best enjoyed slowly and in dainty portions. Oooh, your tasty tarts would be perfect with a cup of tea! hello Jean! What a beautiful Bakewell Tart. I've been in Bakewell and we did buy a tart there. I'll have to bookmark this and try it. This looks and sounds delicious Jean! It would be delicious with a cup of tea. Karen, I'm glad I posted something that is new to a lot of people! Yes, Pauline, dainty portions are a must! Margie, yes, they are soooo good with a cup of tea. One guest wanted coffee, but well he was just wrong! Ellen, how wonderful! I've never been to Bakewell, but I'd love to go there. I hope you'll try the recipe soon and let me know how you liked it. Jann, thank you! I'd love to bring you a plate! This looks delicious! When I visited Bakewell a few years ago I had my first taste of Bakewell Tart. I look forward to trying your recipe - thank You! Thank you, Honora. I hope it meets your expectations - I've never been to Bakewell! Be sure to brew a pot of tea to have with it. This sounds wonderful, Jean. Perfect for our office parties! Thanks, David! I hope you'll try it soon. I've been reading lots of English mysteries and they often mention having a bakewell tart and I never knew what it was. Now I do and now I understand why everyone wants them! This looks easy but most of all so delicious! Thanks -- will have to add it to the summer recipes. Or maybe all recipes! Jeanie, I hope you'll make it soon for one of your teas. It freezes well, too, so don't think you have to wait for an occasion! Have you ever tried a cherry Bakewell, Jean? It has a soft icing cover with a cherry on the top. Bakewell Tarts / puddings are loosely associated with the town of Bakewell in Derbyshire, home county to Fitzwilliam Darcy. His family seat, Pemberley, is located in Derbyshire in Pride and Prejudice. Jane Austen gets everywhere!!!!!! Tony, no, the cherry Bakewell is not for me - I don't like icing. Even as a child, I scraped the icing off anything that had it! I'd love to visit Derbyshire (and all the Jane Austen-related sites). Oooooh this sounds so good, I'm crazy for almonds, I could eat the frangipane all by itself and be happy! Thank you, Sue! I feel the same way! You had me at raspberry jam! :-) This looks delicious and I will definitely have to try this. Thanks for stopping by. Yes, Little Chick is really growing. Time has a way of flying by. I look forward to stopping by! :-) Have a great weekend! Thanks, Mama Hen! And, yes, isn't raspberry jam just The Best?! Thank you, Maristela! I love pastel de nata, too! That looks like the perfect summer dessert, so glad I happened along your blog. Now I know what I need to make this afternoon when I am done gardening to escape the heat outside! I have almost everything to make this (no almond flour! ), and even my homemade raspberry jam. I have two quarter sheet pans and use them all the time, and they fit perfectly in my Breville toaster/convection oven. I'll have to make this soon and enjoy it with a cup of tea. Christine, thanks so much. I'm glad you happened along! Thanks, Kitty! Aren't those pans a handy size? I love using them in my toaster/convection oven, too! Especially during hot weather. I have some tart pans and love them Jean! you always post such delightful baked goodies! Thank you! Thank you, Bernideen. We tea girls have to have our tea treats! They are nearly too pretty to eat, but I am willing! Thanks for sharing at Celebrate 365! They are lovely! How interesting, Jean--and beautifully presented as always. Don't know if I've ever heard of these. Thank you, Jan! I'm sooo glad I have 16 of the 48 slices waiting in the freezer for me! Thanks, Sue! They are an English thing, so lots of people here haven't heard of them - you're not alone! I hope you'll try the recipe sometime because there's nothing quite like a Bakewell. Can you call me for a tea with this bakewell tart. I love it, You made is perfectly . I need to try it for myself.pinning and tweeting. Swathi, thank you! I'd love to have you over for tea and a Bakewell tart! This looks simply delicious!! Lovely images too. Have a great day ahead ! Thank you so much, Shantana! I like pretty food! This looks like a delicious and classic treat - perfect for an afternoon coffee/tea or brunch. Pinned! Thank you, Nicole! And Pins are much appreciated! Thanks for bringing you post to last week's Pit Stop. And thank you for hosting, Janice. Great tips! 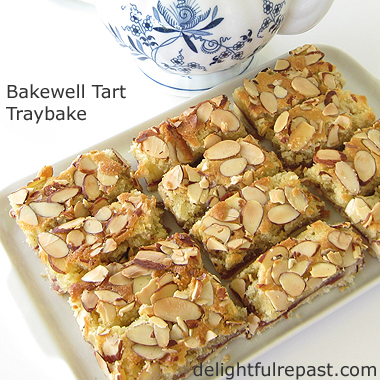 I have so many recipes for bakewell pinned but as you say, they're usually in a big round. Your recipe looks so easy and I like the idea of squares better. I will be giving this a try, a scrumptious sweet to have with tea. Judith, thank you. I do hope you'll try it soon and let me know how you liked it. Everybody I serve it to raves about it, so I hope you will as well! I enjoy finding and trying out new recipes. Your tart with almonds sound delicious. Found you on Blogging Grandmother Wednesday Aim Party. Joy, thank you AND thank you for following. Much appreciated. Your killing me here Jean. Dang this looks good! OK, I'll add it to my list of sweets to make when I have enough people around to share. Maybe it freezes too!?!? Richard, of course it freezes well! Am I not The Freezer Queen?! I slice it up and freeze the slices in my 3-cup rectangular Pyrex glass containers. I think you're going to like this one! Let me know. These look delicious. I think the almonds make the dessert. Love the blue tea pot. Blue in the home is so lovely. Thanks, Sheri. I probably went a little crazy with the almonds on top, but I do like almonds! A reader named Sylvia emailed me to ask: Can I sub the raspberry jam for anything else or leave it out? I don't like jam that much. I answered: The raspberry jam (or any other flavor of jam you might like) is just a very, very thin layer between the pastry and the frangipane. Adds a flavor note and a bit of color, but if you really don’t like any sort of jam at all I don’t see why you couldn’t leave it out. I hope she'll try it that way and let me know how it turned out for her. I'm sure there are other readers who don't care for jam.